FIS has a commitment to language learning, which it demonstrates through English as the principal language of instruction, second language classes at multiple proficiency levels, English as a Second Language (ESL) and mother tongue support. Our host country language – German – is offered to all students up to grade 10. Language learning is also offered as part of our After School Activity (REAL) program and Rosetta Stone is free for all FIS students. Our ESL program supports students for whom English is not their strongest language. In First Steps and Pre-Primary, classroom teachers emphasize English language learning and development throughout the school day. In Primary and Grade 1, ESL teachers work closely with classroom teachers to meet the language acquisition needs of the students. Everyday conversational language is acquired quite quickly; children are usually able to participate in classroom routines and socialize with other children in their first year of English learning. Of course, more complex academic language takes longer to develop. 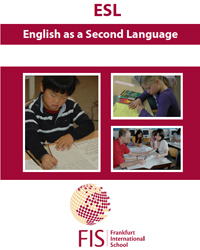 Research shows that it may take five to seven years for ESL learners to acquire the academic aspects of English to a similar standard as their native-speaking peers. Participation in the German language program is compulsory for all students from Pre-Primary through Grade 10. The German program is designed for students to develop communicative competence in their host country language. 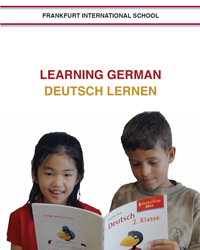 The school offers instruction in German as a mother tongue (“Deutsch”) and as a foreign language. In the early years the program is centered around listening, comprehension and speaking skills. Students are more formally introduced to reading and writing in German in Grade 2.